WAIST HIGH: Joy Division Members Join Campaign For Ian Curtis Memorial Bridge. Joy Division Members Join Campaign For Ian Curtis Memorial Bridge. Former Joy Division bandmates Stephen Morris, Bernard Sumner, and Peter Hook have backed a campaign set up to rename The Epping Walk Bridge in Manchester after singer Ian Curtis who died May 18, 1980. The Epping Walk Bridge in Hulme, a suburb of Manchester, England, was the location of a series of photographs of Joy Division taken by Kevin Cummins in 1979, including the one used on the cover of The Best of Joy Division. Supporters of the campaign say that renaming the bridge will be a fitting way of commemorating the 30th anniversary of Curtis's death next month. The creator of the campaign Gayle O'Donovan, the Secretary of Manchester Green Party, says, "Hulme locals are all too aware of how marginalized and put-upon this part of Manchester feels, which is partly why we want this campaign to succeed. 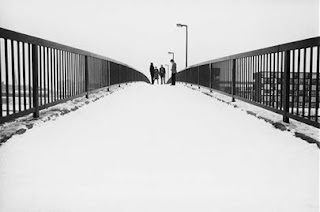 "The bridge itself is already known to certain locals as 'Joy Division Bridge.' The re-naming of this bridge would allow fans and visitors to Manchester the opportunity to visit the bridge and recreate Kevin Cummins photographs and to celebrate the city's fine musical heritage. Fans of The Smiths, regularly congregate around the entrance to Salford Lads' Club, featured on one of their albums. Renaming the bridge gives Joy Division fans their own part of Manchester." Joy Division bassist Peter Hook told the Manchester Evening News that he thinks "it's very fitting for him to cross Princess Parkway on a road that leads to the Hacienda," and added that there should be a sign on the bridge saying 'This Way to Unknown Pleasures,' - a reference to Joy Division's debut album. Campaign for Ian Curtis Memorial Bridge. Join!